About a month ago, I wrote a blog post about how picture books are not just for storytime, and shared some of my favorite picture books to read to grades 1-3. But there are some really amazing picture books for the tween crowd (grades 4-6), too. I used to teach library at an upper elementary school, and part of my weekly schedule included doing storytime with third, fourth, and fifth graders. This was an opportunity to talk about themes and characters–but it also provided a chance for kids to connect to stories through stories of their own, stimulate their imaginations through visual appeal, and get my students excited about all kinds of literature. On the rare occasion that no story was planned for library class, the kids would ask me, “Aren’t we going to read a story today?” and usually expressed genuine disappointment when I replied, “Not today.” This told me that, despite their ages, my students craved stories and valued storytime. I also found them reading picture books together during free time. Although they didn’t know it, reading aloud with a buddy is a great way for kids to build expressive skills. Check out some of my favorite picture books from tweens below! Anderson, M.T. Me, All Alone, at the End of the World. Illus. Kevin Hawkes. Candlewick Press, 2005. A young boy lives all alone by himself literally at the end of the world. His days are filled with wonder as he explores the wilderness and plays with extraordinary creatures, but the boy begins to reevaluate things when an old man shows up, promising to bring fun without end. The old man, Mr. Constantine Shimmer, stays true to his words, building an amusement part at the end of the world which brings tourists all year round. The boy makes friends and enjoys the amusement park like everyone else…until he starts to miss nature and quiet time. Kevin Hawkes’s water color and acrylic illustrations perfectly compliment M.T. Anderson’s rich, natural prose, which give the world a texture that makes this otherworldly setting seem very old, lived-in, and real. Yes, you read that right. This book was written by the same M.T. Anderson who wrote Feed. I’ll admit, that’s the reason I picked up this book in the first place. And I’m glad I did, because it’s become one of my favorites. 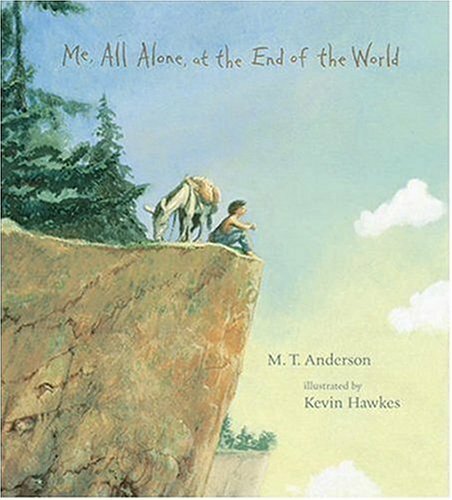 Some kids tell me this story is about how we should respect nature, while some say it’s all about how it’s okay to be alone. This is a beautiful message, especially in a world where success is sometimes measured by social engagement. But not all kids are natural extroverts, and I love that this book tells them its okay to be who they are. Despite this seemingly calming message, the book is anything but. As Mr. Constantine Shimmer comes on scene, things get crazier and crazier, and when the boy decides that enough is enough, the peaceful ending comes as a relief! Ryan, Pam Munoz. 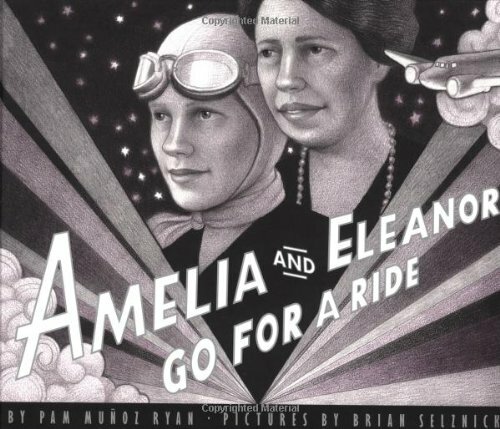 Amelia and Eleanor Go for a Ride. Illus. Brian Selznick. Scholastic Press, 1999. Amelia Earhart and Eleanor Roosevelt each made their own mark on history, so it only makes sense that they would have been friends. And in fact, they were! One night, the two women go for a flight from Washington, D.C. to Balitmore and back, despite the protests of the secret service. Based on a true story, Pam Munoz Ryan and Brian Selznick team up to show the truly independent spirits behind these two women. Though rendered in black and white, Brian Selznick’s illustrations evoke a magical tone and depicts history with vivid texture. This is yet another book that displays the talents of two popular children’s authors: Pam Munoz Ryan, known for Esperanza Rising, and Brian Selznick, known for The Invention of Hugo Cabret. That alone is bound to garner interest from tweens. I also love this book for tween because it’s a great story to use to get them excited about history, and it provides a great example of two women who did whatever they wanted at time when women didn’t always have that power. There’s a lot of historical context here, as well as emphasis on what it must feel like to fly a plane, which makes this perfect for older readers with a greater ability to focus. It’s also a great chance to talk to students about social issues. If nothing else, Selznick’s nearly-realistic illustrations will mesmerize readers. Scieszka, Jon. 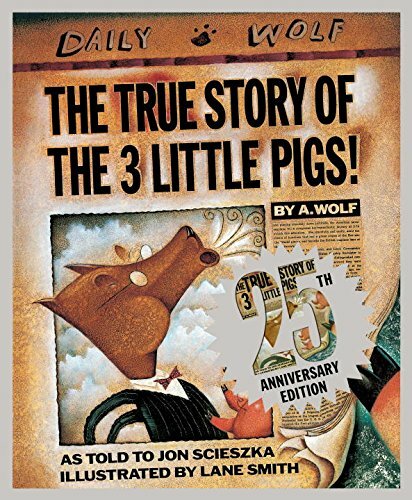 The True Story of the 3 Little Pigs. Illus. Lane Smith. Viking, 1989. This is wolf’s version of the “Three Little Pigs.” When he goes to borrow a cup of sugar from his neighbor, the first little pig who built the house of straw, and accidentally sneezes the house down, things progressively go from bad to worse. Mr. Wolf claims he was framed, but was he? Scieszka’s conversational prose pairs with Smith’s muted illustrations to add nostalgic character to the wolf’s tale. This is a timeless classic that always seems to work with tweens, perhaps because it’s a spin on another timeless classic. It also includes some darker tones, with the wolf gobbling up the pigs just because he didn’t want perfectly good ham to go to waste. And even though the tweens know what is coming next, they’re still wrapped up in the story. After the story, this is a great opportunity to talk about character and narrative. Why did the wolf eat the pigs? Why did he believe he was right? I could even use this to model storytelling and take another fairy tale to twist. Tan, Shaun. Rules of Summer. Arthur A. Levine Books, 2013. A boy gives a imaginative narrative of what he did last summer, phrased by sets of rules. Starting with some seemingly practical rules, such as “Never leave leave a red sock on the clothesline,” the rules become gradually more and more sinister. 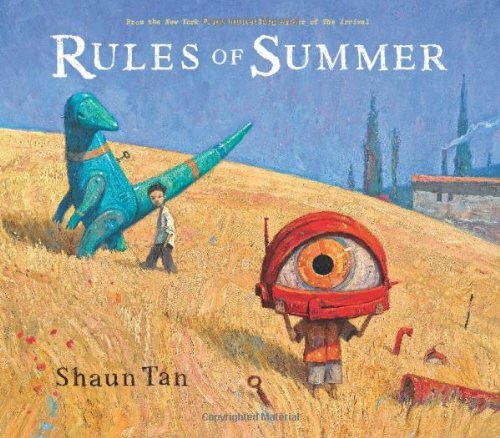 Shaun Tan’s accompanying illustrations paint a dual story of the relationship about the young narrator and his brother, monsters and horrors they face, and the dire consequences when the narrator does not follow his brother’s rules. Tan’s abstract oil paintings,more fully realized by the contrast of light and shadows and stark reds, add a layer of suspense that sparks emotion of both menace and wonder. Wisniewski, David. Golem. Clarion Books, 1996. Based on Jewish legend, a rabbi molds a giant called Golem out of clay, tasking him to protect the Jewish people from those who persecute them. Golem dutifully fights against his enemies, though he yearns to simply enjoy being alive and watching the sunset. 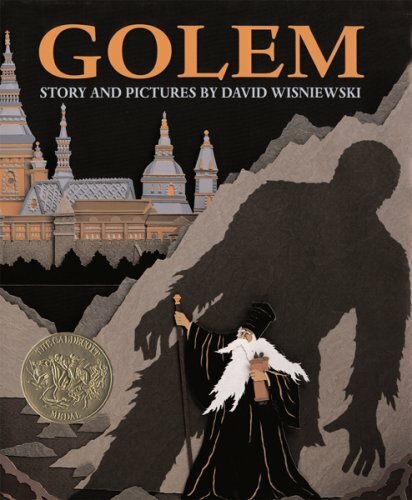 But when his task is done and the Jews are safe, the rabbi returns the Golem to clay even though the Golem begs him to “Let me live!” Fashioned by color aid, coral, and bark cut papers, David Wisniewski’s illustrations depict a vividly majestic, yet shadow-hung Prague. Contrasting the stately Prague Castle with the earthly Golem and humble Jewish ghetto, Wisnewski portrays the drama between cultures and the desperation of the Jewish people.